Max’s has continued to bring out incredible products. By the name of Max&rsquo;s Creobol, it is an advanced creatine and nitric oxide boosting supplement specially formulated to increase speed, strength and pump. Max’s Creabol has used a great combination of ingredients to maximise performance and allow users to train for longer. Creatine Gluconate 1100mg, Creatine Di-Malate 1000mg, Creatine Di-Malate 1000mg, Creatinol-O-Phosphate 200mg. Vitamin C (Ascorbic Acid) 60mg, Potassium (Potassium Citrate) 26mg, Sodium (Sodium Citrate) 12mg, Calcium (Calcium Citrate) 10mg, Magnesium (Magnesium Citrate) 8mg. Max’s have stepped up their game in creating their latest product, Max’s Creabol. This highly potent creatine supplement has multiple stand out points that users can consider adding to their exercise regime. 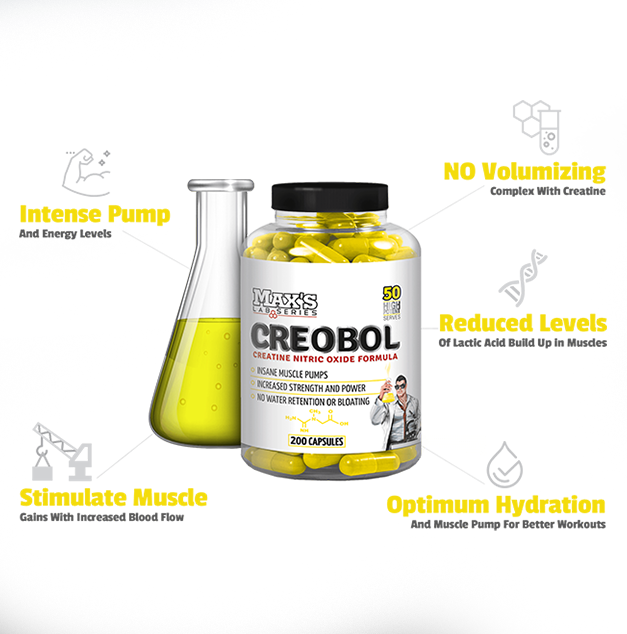 Creobol’s effectiveness lies in its formulation by combining creatine with nitric oxide stimulators to maximise blood flow during workouts. This essentially, allows greater muscular growth, leading up to bigger and faster gains. The formulation is made up of three different complexes that all serve a purpose to support speed, strength and power as well as reducing fatigue for longer training performance. One of the biggest highlights of Max’s Creobol is their creatine blend. It is a blend that includes three types of creatine (gluconate, di-malate and creatinol-o-phosphate). Each form of creatine in this blend is highly soluble that supports the absorption process. The benefits of this blend can support an increase in strength, power and muscle gain at lower doses. The nitric oxide volumising complex contains two important ingredients that can work in conjunction with creatine to further enhance blood flow, strength and endurance. Citrulline malate has the ability to increase blood flow to the muscles. At the same time, Creobol has added betaine anhydrous in the complex that goes well with creatine because betaine also drives water into the cell causing it to swell which leads to more muscle growth. This is highly beneficial for those looking to grow new muscle cells or looking to increase muscle mass. The last part of the complex is an electrolyte complex that helps users feel replenished and maintain muscle and nerve function. As creatine continues to be an ergogenic aid for many supplement users Max’s Creobol is a great option for those looking to build muscle and gain extra strength. Max’s Creobol has done extensive research that it does not have any negative aspects. Creating a product in a pill form is not only convenient for users to use on the go, but it poses positive aspects over using a creatine powder. This is because creatine powder has to be mixed properly for easier transportation and for dosing purposes it is important to get the right amount in the system. Creobol in a pill form can help minimise consistency and increase overall effectiveness of the product. Max’s Creobol is currently only available in capsules. The bottle contains 200 capsules that is enough for approximately 25 serves. Max&rsquo;s Creobol is a highly recommendable advanced formulation with a great combination of creatine and nitric oxide. It can be seen as a product that offers an increase in muscle fuel and nitric oxide support. If you are an athlete or bodybuilder, Max’s Creobol is a product you can add to your shopping list to help you lift more weight, do more reps as well as increase blood flow to the muscles.